With the exception of the BVI Half Marathon, Rueben Stoby has been dominating the local road racing scene for the last three years, earning successive 2 miles, 5K and 10K victories on both Tortola and Virgin Gorda. This year however, has been quite different. 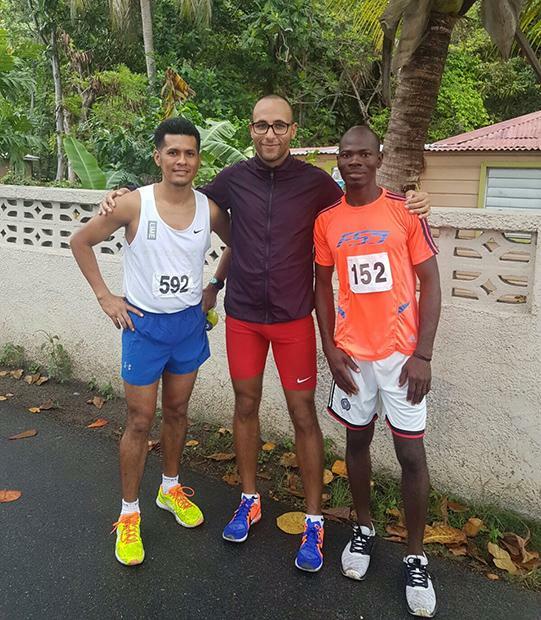 Stoby's 3-year race dominance on Tortola came to an end during Saturday's Blenheim Trust 5K Series tour of Tortola stop in Carrot Bay, when he was overhauled by debutant Clif Struiken over the last 800m, who went on to win in 18 minutes, 17.0 seconds. Stoby followed in 18:22.5, while Julius Farley was third in 18:44.4, as the top three runners all broke 19 minutes on the course where the record 92 runners faced a hill going to and from the Carrot Bay Cultural Fiesta Village out past Bomba Shack and return. It was Stoby's second successive setback after Virgin Gorda resident Vincent Fournier sealed the Dive BVI 5K Series there on March 18, winning that race in 17:38 to Stoby's 18:49. Fournier who snatched Stoby's title, also bested Stoby in the opener, 18:18-18:20. "I didn't go with the pace. Normally, I attack the course and I've run sub 18 every time I've run the course, but I wasn't feeling like I was in that condition so I let others go ahead and there were about three others ahead of me," Stoby noted. "Coming back, I caught them and only Cliff went with me. I tried to get away from him with 800m to the finish, but, he kept going with me. As fast as I went, he matched my pace and continued while I struggled a bit to end the race. He was just too strong for me today. It was the first time I'm coming up against him." Struiken, who had been doing cross fit work, had not run an individual race in 10 months and said it was a good race. He said ran with Julius Farley along the coast, and at about 3K, Stoby passed them. "I instantly thought that I'm going to follow him and at 4.2 kilometers, he again sped up and I thought again, it's off to the finish and I was able to maintain then increase my speed a bit and I got the win," Struiken explained. "I knew I had an okay 5k, but I hadn't run in a long time and I just started running again, so I was surprised I got the win eventually. I'm very much looking forward to battling him again in the near future." Stoby said he might have attacked too early. "I tried to go hard from far out to see if I could break him, but he kept running hard with me," Stoby reflected. "I haven't had a challenge like that in a while, but he ran a good race an I'm looking forward to more competition from him and hopefully, it will make me run faster." Katrina Lindsay, 10th overall in 20:57, was the top woman. Top finishers. Men: Clif Struiken, 18minutes and 17.0 seconds. 2. Reuben Stoby, 18:22.5. 3. Julius Farley, 18:44.4. 4. Matthew Harkness, 19:34.2. 5. Paul Mellon, 19:58.8. 6. Jacques Roux, 20:24.0. 7. Guyp Dubois, 20:43.3. 8. Zebalon McLean, 20:53.89. Colm Rafferty, 20:56.6. 10. Brad Goggin, 20:57.7. Women: 1. Katrina Lindsay, 20:57.7. 2. Rebecca Paul, 22:51.5. 3. Kim Struiken, 23:06.8. 4. Rosmond Johnson, 25:07.2. 5. Sarah Harkness, 25:40.7. 6. Kay Reddy, 26:35.9. 7. Debbie Bell, 26:37.6. 8. Krystal Blackman, 26:48.9. 9. Patricia Snoei, 27:08.8. 10. Karrina Stead, 27:15.9.